The Tudors put on an excellent display to beat a revitalised Whitehawk 2-0 on Tuesday night. 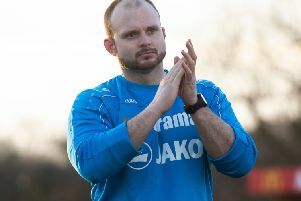 Hemel kept a clean sheet for the first time since the beginning of August and scored two excellent goals in the process. Whitehawk have a much changed line up since the start of the season and are very much improved, so it was always going to be a difficult game. The Tudors were keen to keep their own unbeaten run going and they did it in style, soaking up pressure at times but always looking dangerous themselves. James Potton had one of his best games in a Hemel shirt and was in the thick of everything from the off, he had an early header cleared off the line and was always looking to get on the ball. With boths sides having brief periods of control, the home side finally forced some sustained pressure leading up to the interval and they were rewarded for their efforts when a through ball from Matty Saunders eluded Hawks back line, Potton was on to it in a flash, controlling it first time and firing home brilliantly from a tight angle. With 44 minutes on the clock it was the perfect time to score and nothing less than they deserved. The second period saw Whitehawk push for an equaliser but the hard working Hemel back line kept them at bay. Just after the hour there was a scare for The Tudors when the dangerous Danny Mills found some space at the back post and crashed his header against the upright, the follow up shot was superbly saved by Jamie Butler and the ball was cleared in the scramble that ensued. The game was finally settled in the 75th minute when Lewis Taafe, who had swapped from the right wing to the left, cut inside and created just enough room to get his shot away, Lucas Covolan in the visitor’s goal was late to react and the ball crept inside his near post to put The Tudors two up. There was some late pressure from Hawks late on and with the referee adding five minutes injury time into the mix, it was back against the wall for Hemel, but two excellent saves from Butler and a goal line clearance by Jack Kelly ensured the clean sheet remained intact. A much improved performance from the home side and it’s now seven games unbeaten for Dean Brennan’s new look line up, any early fears of a relegation battle this season, firmly put to bed. Indeed Tudors fans are looking upwards these days as they start to climb the table. Next up, a tricky FA Cup tie down at Gloucester City on Sunday and with a supporters coach already nearly sold out they will be assured of some noisy support on the day. Man of the match James Potton.